Insert the tip of shoulder strap into the attachment part of this unit ( ). Insert the shoulder strap into the ring ( ). Adjust the length of the belt, and then fix with the strap lock ( ). Attach the lens cap when this unit is not used or during transportation. Attach the lens cap to the grip belt while recording is in progress. Use of the lens hood is recommended for shooting outdoors with exposure to direct sunlight. 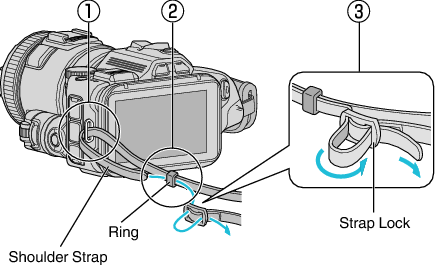 Align the indicators ( mark) of lens hood and this unit, and attach the lens hood by rotating it. Remove the lens hood when flash and/or light are used. Vignetting (the screen getting dark, or appearance of shadow) may occur. Attach the monitor hood if the monitor screen is difficult to see due to the sunlight. Attach the claw located at the upper part of the monitor hood to insertion point at the upper part of the LCD monitor. Then attach the claw at the bottom part of the monitor hood. Attach the viewfinder for shooting in a bright area, such as outdoors, if the monitor screen is difficult to see. Attach a viewfinder after removing the viewfinder terminal cover. Attach or remove the viewfinder after turning off the power of the main unit. 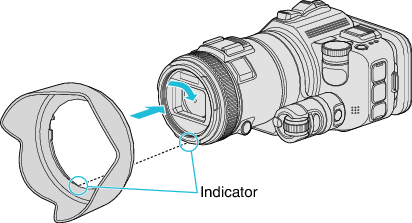 By pressing the Monitor Switch button located on the side of the viewfinder, monitor display is switched between the LCD monitor and the viewfinder. Make adjustments with the diopter adjustment dial if images displayed on viewfinder is difficult to see. Attach a viewfinder (sold separately). This may not be commercially available in some regions.